Sometimes finding individuals who died 150 years ago can be easier than finding those who died recently, or are still alive, but this is exactly what Time Detectives™ are sometimes asked to do. We were recently approached by a client we have worked with before, a member of the Redknapp Family (yes Harry’s relations) to help track down an Uncle who was believed to have died, but contact with him and his children had been lost over the years. Finding such records for very recent deaths when you have no details can be problematic, and takes careful research, in this case a trawl of all the Redknap and Redknapp death records up until fairly recently failed to show any positive hits. This meant that we had to step back into the history of the individual concerned, and then carefully moving forward through marriages and children’s births to pin point the geography of the Family. In this particular case, we hit upon census, polling, and Merchant Navy records to confirm addresses and relationships over time. Along the way a picture builds up of a man who travelled the world serving in the Merchant Marine, running the gauntlet of German U-Boats, this allowed us to find him on a ship in New York. We also found him on the Thames as a Lighterman, that had been a Redknapp Family trade for 200 years (you can read more about the Redknapps on the River Thames here – The Redknapp Family History Part 1; Origins, Redheaded Merchants on the Thames). So he had a full life, and eventually retired to Essex, his life was fascinating in itself. The last area we searched turned up a hit on a funeral service that seemed to fit the identity of the man concerned, but contained very few details of anything other than the funeral service itself, but gave us a rough date to go by. Once the trail started to dry up, it was necessary to come down to the man’s children, this was made harder as he had daughters, meaning that when they married, there was a name change bringing an extra layer of complexity to the search. If they disappeared from the records, was it because they married, or because they died? In this case, one daughter died, and two married. At this point research has to centre more on old telephone directories, lists of voters, and sometime social media. The search is helped if the people concerned have middle names, and also if their married names are less common. Our search took us back to Essex, and to a number of streets across a fifteen year period, gradually narrowing the number of likely people, until we were confident that we had found our client’s relations, and could pass on the information for them to make contact direct, although there is the option of Time Detectives™ making first contact if there is the worry of what the reaction will be, fortunately that wasn’t the case in this instance, the Family had just drifted apart over the years, as is often the case. Lastly we investigated local Newspapers, and Emergency Service Records, to see if we could find more information concerning our client’s Uncle, and sadly we did. He had tragically died in an accidental house fire. This information was passed on to our client. So a Family reunited and a mystery solved. The East India Company, or Honourable East India Company (HEIC) as it was known, plays a major part in the Tom Hardy series “Taboo”. This struck me as interesting, as I had uncovered a connection between the Company and a relation of Danny Baker, the TV personality, in the Baker Family Tree. Even stranger, a further coincidence with the present echoing the past was thrown up involving Alexandra Baker, Danny’s niece, and now a very successful PR company owner in Los Angeles. Tom Hardy’s character in the series on TV utters the memorable words “I do know the evil that you do” to the Head of the HEIC in London. To see what the implications of this were, and indeed, the impact, influence, and adventures of the Families involved in the Company’s business long after it’s demise, it was interesting to find it reflected in a real individual in a real Family Tree, as reflected in this excerpt below. Family history can sometimes throw up some strange and unexpected coincidences that look like echoes of the past, and one of my favourites is in the Baker Family. Phoebe Jeanette Baker was the youngest of eight children born to Robert William Baker a Chemist and Danny Baker’s Great Great Grandfather. Phoebe gravitated away from her parents towards her brother Robert William and his wife Maria, she was not that much older than Robert’s eldest children, so was treated like an older child. Visiting her older brother in the East End brought her into contact with the mystery of the Poplar Docks, sailors from all over the world, exotic sights and smells from the spices and other cargos coming into the port of London, and the sun tanned hard skinned men from the boats. Then in 1889 the Docks exploded with the Great Dock Strike, when the Dockers came out en masse to get “The Dockers’ Tanner” – sixpence (2.5p in modern terms) a small reward per hour for the back breaking work they had to do, the strikes lead to violence and unrest in the Docks, and men’s families started to starve, the atmosphere was fragile and sometime chaotic, for Phoebe there were threats to stability nearer to home, as her Father’s health was being dragged down by Bronchitis. Into this sea of unease besetting the 19 year old Phoebe breezed the 30 year old ship’s Captain Abel Wardlaw Best. Five feet ten (tall for the time), tanned and well built, with thick brown hair and grey eyes, a strong man fresh from the China Seas, Abel must have turned young Phoebe’s head. Abel Wardlaw Best was indeed an exotic creature, born in Agra in India, the son and grandson of Barbadan Sugar Plantation Slave owners. The Family had built its wealth on the backs of its Planation Slaves, but this had been dealt a blow during the Napoleonic Wars, when in 1808 Great Britain banned the “Slave Trade” (but not slave owning) in the British Empire, and the Royal Navy intercepted and freed slaves from all it suspected of carrying them, including foreign vessels, much to the anger of the young, slave owning USA and Plantation owners in the Caribbean. This first step was followed by an outright ban, the Abolition of Slavery, in the whole of the British Empire in 1834. Strangely Slavery was never abolished in Great Britain as Slavery had not been recognised as a legal state of existence since before the middle ages. This was actually defined under English Law in a court ruling, that neither in written law or “Common Law” (the unwritten Law of common practice by the English people) was slavery recognised as a state of being, and indeed was effectively in breach of an Englishman’s right of Habeus Corpus as enshrined since the 13th century, i.e. the English right not to be held against their will without trial. (“man” in this it’s original English definition of “a person” not the post Norman definition of “a male”) . This had lead to some interesting situations, as legally any slave that set foot in Great Britain could be viewed as no more than a servant, effectively automatically free, and there are recorded instances of the Cockney “Mob” in cahoots with Black Londoners, attacking rich foreign and colonial slave owners in London and their slave catcher agents to spring black slaves from their servitude. This was such an issue, that no less than Justice Sir John Fielding, the man who developed the first Police force in London, advised American and Caribbean Planters visiting London, not to bring their Slaves with them, as once in London, seeing and being approached and encouraged by the numbers of free black people living in the metropolis, they would not only demand wages, but were likely to run off to get baptised and married, and the Planters could find themselves in mortal danger from the working class populace, “The London Mob”, should they try to retrieve their slaves. Intriguingly some of these freed London slaves went on to join the Royal Navy and faced the prospect of being part of the Navy’s anti-slavery Patrols, thereby actively freeing up other African slaves. Even the plaque on the side of Nelson’s column in Trafalgar square in the heart of London shows a black sailor, holding a rifle on the left, on Nelson’s flagship fighting the French. Once not only trading in slaves, but the owning of slaves was itself outlawed, the Best Family from Barbados received over £7,500 in compensation from the British Parliament (the equivalent of around £10,700,000 in today’s economic terms) for the freedom of their 1,323 slaves. Like many British West Indian Plantation owners, the Bests used their money and connections to maintain positions of power in the British Empire. Many plantation owning families like the Bests, seeded their sons into the British East India Company (EIC), and from there into the British Diplomatic and Judicial Corps in India. India up until the mid 19th century being run as a quasi possession of the East India Company under British Government sanction. As well as their money and connections, the Planters’ families could boast a knowledge of trade in goods from the tropics to more temperate parts of the world, as well as a tolerance for tropical conditions generally, and an assumed superiority and willingness to exploit native workers. The Bests jumped into this world with a certain gusto, which is how Abel Best of our story managed to get himself born in Agra, the son of former slave owners, now having thrown in their lot, and indeed welcomed with open arms by the EIC in India, where Abel’s father served in a political and judicial role on behalf of the EIC. The family seemed to court adventure, which they duly found in the city of Agra during the Indian Mutiny. The EIC ran a Private, but British Government sanctioned, Colonial Army in India. The EIC Army was actually three separate Armies, those of Bengal, Bombay, and Madras, numbering at peak over 120,000 men, so one of the largest standing armies in the world. It was used both to maintain order in India, and to fight wars around the region, including major actions against, Sindh, Persia, China, Afghanistan, Burma, Nepal, the Punjab, and against the Sikhs, as well as providing volunteer officers and men for the Crimean War against Russia (via the Anglo-Turkish Legion). The largest number of men in the EIC Armies, were local Indians, armed, trained, and paid by the EIC and generally called Sepoys, alongside these native Indian troops, there were European, mainly British and Irish Troops under EIC pay. In the TV story Taboo, Tom Hardy’s character had been a Corporal in one such unit. The entire Officer class, needless to say, were British. In 1857 the EIC authorities in Agra received news of the mutiny of Sepoys in other Indian Cities. In response they had the Bengal Fusiliers, the local EIC British Troops, disarmed the local Sepoy Troops. This was despite the fact that for two months the Sepoys had shown no sign of rising in revolt, despite the uprisings in other cities. In May 1857 6,000 refugees; British Families from the surrounding area, poured into Agra, this was triggered by unrest and rumours amongst the Indian population on the back of the general uprising against the East India Company in Delhi. Disgruntled at having been disarmed, and faced with a massive influx of panic stricken British refugees, the local Agra Sepoys attempted a brief uprising in June 1857, probably more for effect than in any organised military manner, and lacking the arms of the EIC British troops, they were driven off and the British holed up with their civilians in the Fort at the heart of Agra. The Bengal Fusiliers sealed off and defended the Fort before any serious violence could occur, and the displaced Sepoys set up a half hearted siege, it seems almost pandering to a kind of wish fulfilment for the panicked British civilians. The farce started to turn into a crisis due to the crowding of British and other European civilians in Agra, not because of shortages of food or water, but more because of fear and a lack of medical supplies. But the fear was real for good reason; the Sepoys in other areas did have a reputation for shocking treatment of captured men, women, and children, so the British Bengal Fusiliers held the City doggedly, driven by fears for the women and children. Many of the Sepoys lost interest and headed off for the siege of Delhi, which was a much more dangerous and exciting affair. Delhi was eventually relieved by the British, who then sent a flying column of battle hardened British, Sikh, and Punjabi troops, to Agra. Contrary to popular myth, many Indians and other local troops including the Sikhs, Punjabis, and Gurkhas, stayed loyal to the British, and were a major factor in putting down the uprising. The relief column when it turned up at Agra, was initially treated with disdain, mainly because they had taken to wearing rough Khaki uniforms (the first time British Khaki was ever adopted by British soldiers) much more practical than the Redcoats that were generally worn. The British civilians in Agra, seeing this mixture of deep tanned men of various racial backgrounds, covered in dust with worn and bloodstained clothing, initially thought they were an army of invading Afghans, and for their part, the Flying column was surprised to find the Bengal Fusiliers in Agra resplendent in unblemished red uniforms with immaculate white cross belts, as if on parade rather than under siege. The British column was initially attacked in camp at Agra by Sepoy artillery followed by a cavalry charge, but the British, Sikhs, and Punjabis, were battle hardened regulars, they formed ranks held the Sepoy attack, counter attacked around the Sepoy flanks with Cavalry, drove the Sepoys off, then followed up, catching them at a River crossing where they tore the Sepoy ranks apart with Artillery fire, and routed them with a final Cavalry charge. The siege was over, order and British rule were restored, and the Best’s settled down as part of the ruling elite, with Abel Wardlaw Best being born there on 24th March 1859. Abel’s parents decided to send Abel back to Scotland for schooling, bt by the age of 15 it was felt better to send him to a Naval training ship, HMS Conway, in Liverpool. He graduated from here to the Royal Naval Reserve as a Mid-Shipman, but unable to find gainful employment, the restless young man at the age of 20 became a second mate in the Merchant Marine. where he graduated to a Naval training ship, may have been a very wilful young man, ran off to London and worked on ships till he got his Master’s certificate. After this Abel was off to sea, working his way up to a ship’s Captain in the South China Seas. His travels brought him back to the Port of London and it was here that he met Phoebe and swept her off her feet. Robert William Baker had given in to love rather than follow the demands of his Middleclass Family when he married Maria Clerk, in so doing he swapped salubrious Kensington a perhaps life as a middleclass Chemist, for a working class existence as a Lamp maker to live by the docks in the East End. Seeing love triumph amid the adventure of the Docks, Phoebe set her mind on finding her own romance the way her older brother had. Being wilful and young, just 19, she was literally Shanghaied by Abel Best, who whisked her away from London and from her Family to the other side of the world. The effect on her Mother and Father can only be imagined. Robert William Baker and his wife Anne must have been horrified, their youngest child taken away to the ends of the earth by a 30 year old hard bitten Ship’s Captain. And of course, the shame of it. Their eldest son having lived in sin and raised a family out of wedlock in the docks, and his influence had corrupted their youngest child, leaving her captive to the whims of an older man in a ship on the South China Seas! On a more prosaic level we can believe that in Phoebe and Abel’s eyes, they simply had their honeymoon first, and their marriage after. When they got to Shanghai in China Abel did the decent thing, and on 15th April 1889 they were married in the Cathedral of the Holy Trinity in Shanghai. That same year 1889 her beloved older brother Robert died of Typhus in Poplar, and by 1897 her father had also died. By 1898 Phoebe and Abel were living in Hong Kong, where Abel was working for The Taikoo Sugar Company, once again sugar played a part in this story. Abel was a Wharfinger (Harbour Master) at Quarry Bay. An important job, where Abel would be responsible for the goods and storage on the docks, as well as the docking of ships, and settling disputes between ships Captains and crews, in keeping with his position Abel was also a Juror in the Hong Kong judicial system. Phoebe and Abel, had no children during their marriage, and despite having run off and lived with Abel in China for some years, life away from home living in the strange environment of ex-patriot Shanghai and Hong Kong, a staggering change for a girl from Kensington, would have lead to some homesickness, especially as Abel was often away at sea Captaining Merchant ships between Swatow, Singapore, Saigon and Bangkok. After she heared of her Father’s death, Phoebe sailed back to England to spend some time with her Mother and sisters. So we find Phoebe living in Hammersmith with her maternal family in 1901, where her mother lived off a pension from her her dead husband’s estate, whilst her sisters worked. Undoubtedly Phoebe was much better off than her mother and sisters, Able had both family money and had built up a good business of his own, so she no doubt helped her mother for a while. She must have seemed like a strange exotic creature now to her family, having lived in places they could only dream of and would never visit. Abel did his best, and decided to move to a country more conducive to Phoebe, where she would feel less alienated; the USA. Abel arrived in New York in April 1905, Phoebe left Liverpool on 1st June 1906 and arrived in New York on 10th with £70 in her pocket. This would be the beginning of Phoebe’s next big adventure. Our story now takes an even more interesting turn. When I put together a Family History, it’s not just a dry chart full of names. I always work from the point of view that all those people that once lived, and without whom we wouldn’t be here, have the right to have their stories told, otherwise they are just remain non-existent; telling their stories brings them back to life and a Family History adds to a Family’s dignity and helps explain their place in the world. The actions of our ancestors echo across the centuries in what we are and what we do. So it is always nice when members of the families I produce these works for get in touch to discuss what I’ve found, perhaps do some research of their own, and, very, very, occasionally, become part of the story by unconsciously living a life of adventures that mirror those of their ancestors, showing that both Genes and Memes are passed through the generations. This is what makes the Culture, the Folklore, and the Mythology of a Family. For me, when this happens, it’s like finding a rare gem. This was what I would find when I was contacted by Alexandra Baker, Danny Baker’s niece, who had some questions about The Baker Family Story. Alexandra is a successful Music promoter in California, the CEO of High Rise Public Relations, who started out in Kent and South London, and made her way in the tough world of the Music Industry to her current success, with acts as diverse as Boy George and The Maccabees. Just like Phoebe, Alexandra starting in the South of England, travelled to New York, and then to California forging success in a hard world. So, Phoebe had followed Abel to New York and then to California. This made sense, Abel’s experience was predominantly in the South China Seas, so a California base was what was needed for Able, and something useful to do was what was needed for Phoebe, and sure enough we find Abel and Phoebe living at 251 Winston Street Los Angeles from 1907 when Abel becomes a naturalised American citizen. By 1910, perhaps having taken another lesson from her plucky sister-in-law Maria in Poplar, Phoebe started running a boarding house at the Winston Street address while Able was away. Winston Street was full of boarding houses, providing clean decent lodging for the burgeoning workforce of Los Angeles. As well as Phoebe and Able, there were lodging houses run by a Japanese Family with Japanese lodgers, an Austrian Family with Austrian lodgers, and American Families with American lodgers, plus a German and his American family living in their own rooms. Phoebe and Able had two American lodgers, a salesman and a mariner. All the neighbours except the Austrians and Japanese spoke English. Years later in the 1930s the area would begin a slow decline as the richer owners moved out and slum landlords moved in. It is now the skid row area of Los Angeles, and is becoming gentrified again. Phoebe and Abel move up in the world by 1917 when Abel is recorded as a Rancher. Abel would have been 58 by then, so long stints at sea were probably less attractive, and there was a boom in demand for food driven by the Army’s requirements for suppliers for the millions of soldiers shipped over to Europe, and to fulfil demand from Great Britain for food now that so many men were in the trenches rather than in fields. It was a lucrative business. The timing was interesting as it coincides with a business consortium buying up large areas of relatively cheap Ranch Land, that had been subject to drought in previous decades, the day before the City of Los Angeles passed a bill to build and aqueduct to bring water to the area, and unsurprisingly a major member of the syndicate was also on the committee that passed the bill! The ranch land after initial development for food, soon became prime building land and was sold off in “the sale of the century” to allow for urban development on the suburbs of Los Angeles. It would appear that Able was in the right place at the right time. But the ranching and speculating life didn’t suit the marriage of Able and Phoebe, and the couple divorced sometime between 1917 and 1920. Abel gave up ranching, and lived in the Harvard Military School in Los Angeles, possibly teaching seamanship, interestingly the ceremonial uniforms of the boys were confederate Grey. Sometime after 1920 Abel went back to sea and headed once again for Hong Kong – he had cashed in his chips, and invested his small fortune in stocks and shares, there was nothing to keep him in California anymore. In the 1874 when Jeremiah Joseph Hannon travelled as a teenager from Ireland to the Town of Milford, Worcester County, Massachusetts with his parents and younger brother and elder sister, he had little idea of the adventure his life would turn into. The civil war was over in the USA and there was plenty of work in the North for those willing to take it up, Jeremiah worked with his Father repairing Boots for the local Shoe shop. Having crossed the Ocean, hammering nails into boots seemed like an anticlimax, and Jeremiah set out West in search of adventure. He was 6 feet tall with blue eyes, black hair, and a rosy complexion, and by 1892, in his early thirties, Jeremiah had made it to California to work as a Fireman on the Railroad in Los Angeles. A Fireman’s lot on a steam Train was a hard one, shovelling coal into the train’s boiler to keep the steam up and the engine rolling, it built hard strong lean men, but it was endless toil, and once the excitement of travelling the country by train had worn off, Jeremiah craved more adventure. In 1898 when when Jeremiah was around 40 a new opportunity for adventure presented itself. With the blowing up of the American warship The Maine in Havana Harbour, the Spanish American War burst onto the scene. Spain had been losing power on the world scene since the Peninsular War in the early 1800s when The Duke of Wellington assisted by the Portuguese, and by Spanish guerrillas, had thoroughly defeated Napoleon’s forces in Spain. Years of civil strife followed, fuelled by the Anarchist movement in Europe. Late in the 1800s Spain gained some stability, but the previous weakness at the centre of Spanish politics and the successful overthrow of Spanish rule in Mainland South and Central America had encouraged liberation movements in far flung colonies, notably Cuba, The Philippines, and Guam. Most of these places had been under Spanish rule for around 400 years, and Cuba in particular was thought of as a Province of Spain by the Spanish rather than a colony (a parallel to the British attitude towards Ireland). At the same time there was a movement to expand America’s interests on the World Stage by a number of powerful men in American public life, the US had already mounted an illegal invasion of Hawaii in 1893, this came about because of civil unrest carried out by a fifth column of US Sugar Planters and Missionaries living on the Island over a period of decades (sugar once again in this story). The US invasion, unsanctioned by the US Congress, and therefore to all intents and purposes illegal, was hastened by the fact that the Hawaiians had always leaned towards Great Britain for protection in the past, to the point where the British Government had provided troops and ships in 1843 to protect the Islands from the French, honourably pulling out after a few months when the danger had past, in stark contrast to the US approach in the following decades. The legacy of this Hawaiian-British relationship is defiantly proclaimed in the Union Jack flag still flying in the corner of the Hawaiian state flag! After the invasion the Monarchy of Hawaii was replaced with a puppet Republic largely controlled by US Commercial (Sugar) interests, but this was too precarious for the expansionist forces in the USA, and in 1897, shortly before the outbreak of the Spanish-American War, an attempt to officially annexe the Hawaiian Islands was put before congress and defeated, the defeat in part driven by pressure from the signatures of 21,000 native Hawaiians protesting at the attempt to rob them of what little sovereignty they had left, but a year later, given the likelihood of war with Spain, the US desire for a naval base in the North Pacific was too tempting a prize to be left un-stolen, as the USA would badly need a stopover point for resupply en-route to the Spanish possessions in the Philippines if they were to in consider an invasion. So all pretence of protecting the independence of Hawaii was dropped, and an annexation bill was passed, effectively robbing Hawaii of any chance of independence and self determination. Not wanting to miss out on the adventure, Jeremiah enlisted on May 16 1898 at Little Rock Arkansas, into the 2nd Regiment of Arkansas Infantry, and after basic training, no doubt because of his age and Railway experience, Jeremiah was transferred to the 3rd US Volunteer Engineer Regiment and shipped to Cuba. After a few weeks he returned to the US and was disbanded. By this time Jeremiah had a taste for Army life and adventure, and re-enlisted within two months for a chance to fight in the Philippines in the 33rd US Volunteer Infantry. The War in the Philippines against the Spanish took very little time and few casualties on the American side. The main Spanish garrison in Manilla had little stomach for the fight after seeing their slightly antiquated fleet sent to the bottom of Manila Bay by the vastly superior US Fleet, and offered to put up a token resistance just to save face, as long as the US forces didn’t allow their Filipino insurgent allies take control of the town or molest the surrendering Spaniards. There was some confusion, and some units of US soldiers were involved in heavy fire, but overall the “attack” went as planned. If anything it went too well, as, now in possession of the Capital the US Government decided that rather than handing the Philippines back to the Filipinos, they would replace the Spanish themselves and rule the country as a colony. It was no surprise that the Filipinos didn’t take to this idea, and immediately opened a guerrilla war against American forces as they had for many years against the Spanish. The war was barbaric on both sides, fought in the jungles and villages of the Philippine Islands, and was a foretaste of conditions in Vietnam 60 years later. However, the US forces were so well armed and provisioned that it was a forgone conclusion that they would eventually overrun Filipino resistance. There was some outcry through allegations of looting, burning, and killing out side of battle by US soldiers, and to a great extent this was sanctioned by their higher command. Jeremiah was in the thick of it, his Regiment the 33rd were known as “The Texas Regiment” because they were apocryphally believed to be cowboys, which was undoubtedly true of some but not all the volunteers, but it shows the general demeanour of the regiment who found themselves fighting through the Jungles of the North of the Island of Luzon, where they were instrumental in capturing and killing many important Filipino senior guerrilla leaders. In 1900 Jeremiah was based in Bangued, and town named by the Spanish and meaning “Roadblock” in recognition of the obstacles the Filipinos had put in their way when Spain was conquering the country nearly 300 years before. The US forces suffered comparatively few casualties to action in the Philippines, but many more due to disease, and Jeremiah was no exception to this. He left the regiment in December 1900, and in 1903 when back in the USA. One thing that can be said for the US Government of the time, they did look after their injured veterans well. Jeremiah was shipped to The National Home for volunteer disabled soldiers, Battle Mountain Sanitarium, Hot springs, Fall River, South Dakota. He was suffering from acute Arthritis anterior sclerosis, an inflammation of the eye associated with arthritis, which was leading to atrophy in one of his eyes, plus rheumatism, a hernia, varicose veins, sciatica. Jeremiah was in a bad way. By 1909 Jeremiah had made some progress and is well enough to be discharged to the home of his elder sister Mrs Mary McCarthy in San Francisco, where he plans to be a farmer. Whatever the results of this, we next find him working as a cook in The National Military Home in Los Angeles in 1916. He remains a cook for some years there, with a brief spell in 1918 when he is readmitted to the Sanitarium for his health. Sometime between 1917 and 1922 Phoebe met and married Jeremiah after her separation from Abel. The two live in Kiowa Avenue Los Angeles in the Sawtelle Veteran’s accommodation, and we can only assume happily, as Jeremiah, was hardly a catch given the state of his health and his lowly status, so it was most likely a love match between him and Phoebe. The even voted the same way; Republican! The Veterans home had a noble pedigree, and had even housed Wyatt Earp’s father in his later years. Indeed Wyatt Earp lived with his family in Los Angeles, not that far from Phoebe during her time there. Phoebe and Jeremiah would stay in Kiowa Avenue until Jeremiah eventually passed away in 1932, still an invalid, suffering from pneumonia, he had also contracted TB quite possibly in the Philippines (TB can take decades to kill after an initial infection), which lead to many complications including gangrene in his left foot. The care Phoebe must have provided for him can only be imagined, and with this care he at least managed to live to the relatively old age (for the time) of 75. Their love must have run deep, Phoebe had given up a life of wealth to live with a wounded veteran, as they say, love conquers all. In the same year that Jeremiah died, Abel returned from Hong Kong to England, 19th August 1932. He had amassed a good deal of money during his time at Sea and invested $8,000 (somewhere close to $500,000 in today’s value) in Stocks and Shares, only to get hit by the Wall Street crash of 1929, after this he was quoted as saying “Chinese Pirates and dope smugglers are a picnic compared to the Bulls and Bears of Wall St.”. He was left. as he put it, “…finding that my share dividends would not buy me a cup of tea daily.” so returned to England to live quietly in retirement in The Royal Alfred Home for Aged Merchant Seamen in Belvedere Kent. So spake the last of the East India men. Nine years after his return on 28th February 1941 Abel died. He left £101 in his will, about £16,000 in today’s money. He is buried in St Clement’s Church, Cambridge, UK. Phoebe outlived both of her husbands, stayed on in the apartment in Kiowa avenue as the widow of a Volunteer Serviceman, and she died on 28th February 1944. Her grave shares the same plot as her beloved Jeremiah at South Sepulveda Boulevard Los Angeles, California. And so we come full circle. Having spoken to Alexandra Baker, Phoebe’s Great Great Niece and exchanged some information about Phoebe, I was delighted to see that Alexandra and her cousin took the time to find Phoebe’s memorial in California to pay her respects, from a pair of modern “Amazing Baker Girls” to the original one! Given all the fuss about The Dyer’s Royal heritage, it’s surprising that there seems to be not a lot of meat on the actual tree, so, I’ve researched it independently, and below you can see the first cut of Danny’s actual tree going back to Royalty (Edward III) via Gregory Cromwell, son of Thomas Cromwell. Now given that I’ve already had to successfully put two large Genealogy companies “under the cosh” for passing off my research as their own, I’d like to say that if anyone intends to use the above they’d better make sure they credit it back to Time Detectives ™ with a link to this blog site (www.timedetectives.wordpress.com) otherwise I’ll be forced to “send the boys ’round”, you have been warned. Aladdin Sane was the title of an Album and single released by David Bowie at the height of his fame in the 1970s. The title was said to have been inspired by both his regard for his brother who suffered from schizophrenia, and by the decadence and hedonism he saw amongst young people in the 1970s. The dates in brackets represented the theme of the song, the eve of the two World Wars, when decadence was at its height, and the 197? date represented what Bowie saw as the coming World War in the 1970s (which most of us who can remember, believed was more likely than not against Russia and China at the time). But his family had a more personal tie to these dates. Many of us now in our 50s and 60s had vicarious experience of the Wars through our parents and grand parents, and Bowie was no exception. 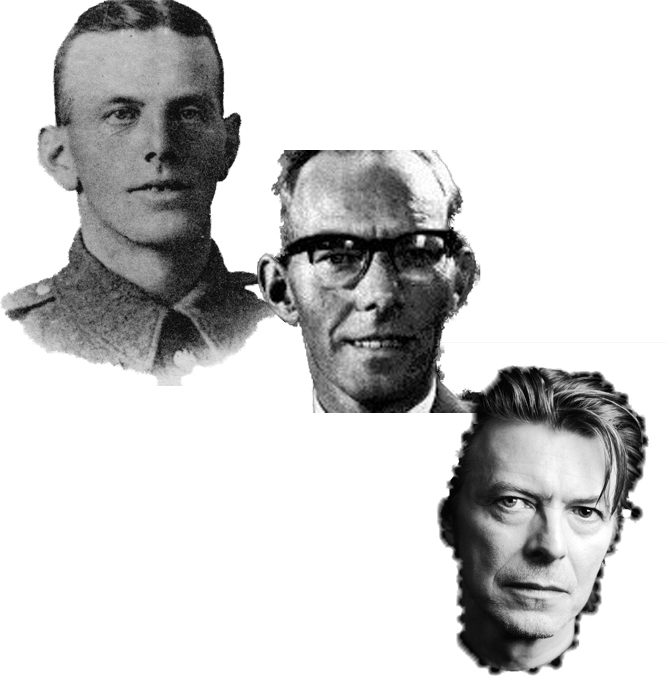 Although born and breed a South Londoner, Bowie (Real name David Robert Jones) had his family roots much farther North. The earliest verifiable records of his Jones family come from the village of Wykeham just inland from Scarborough in Yorkshire. The Joneses were Agricultural Labourers, the most common, and poor, occupation of all British working class ancestors in the 19th century. They were on the bottom of the social heap in Wykeham right through the 1700s and into the mid 1800s. Some of the family managed to get themselves a little land and farm it, and this helped David’s line as it meant that his Great Great Grandfather, Charles Jones, could find employment on his brother’s farm, where, hopefully, he would be less exploited than with another farmer. However, by the 1860s Charles was working on the roads, hard unforgiving work for hard strong men, and an odd choice in a county where there was generally plenty of agricultural work, so Charles probably took up road building for short term gain when the parishes and local landowners decided to upgrade and maintain the local road system and needed to compete on wages to find men to do the work. Charles lived out his life in Wykeham apart from a short time in Hutton Buscel the village in walking distance where his wife Elizabeth Marriner came from. Charles never rose above a Labourer’s level on the roads and fields around Wykeham. Go West Young Man- LEEDS! Charles son Joseph got a break in the early 1870s, he became apprenticed to a shoemaker, and shoemaking would be the making of the family lifting them out of their breadline precarious existence. After serving his apprenticeship in Wykeham, Joseph moved to the industrial magnet of Yorkshire; Leeds. Joseph married Ann Haywood, a Power Loom Overlooker’s daughter. This was a step up in the world, Joseph Haywood was effectively the foreman in a weaving factory, and Joseph Jones must have shown some promise to have been able to marry the man’s daughter, and sure enough this is reflected in the fact that Joseph Jones is no longer a Boot maker, he is by 1881 a Boot maker’s cashier, the first of his line to have lifted himself above low wages and manual labour. The indication is, that for all he was a labourer, Joseph Jones’s father Charles Jones, had made sure his son got an education, even before it became compulsory in 1871, he could read, write, and do arithmetic, very unusual for a labourer’s child born in a rural area in the 1850s. That one fact would make all the difference to how the family would develop in all the coming generations. Charles worked for decades in his Cashier’s job, he rose from cashier to a Management position in the company. he was able to provide very well for his family, living in the same nine roomed detached house, Townend House in Bramley for or 35 years, with his Mother-in-law living alongside them after the death of her husband, and the family being able to afford a live in maid for all that time. No doubt the Jones family were good to work for as one maid, Edith Watkin, stayed with the family for over a decade. Joseph lived long enough to retire by the time he was 60 in 1911, none of his immediate ancestors had come that far. His life seemed settled, successful, and fulfilled, but that was on the eve of The Great War. Robert was the third child of Joseph and Anne Jones, growing up in Townend House Bramley with his parents, three brothers and three sisters, and his maternal Grandmother in a strong and stable middleclass family environment. His parents believed in education the way his Grandfather had, and Robert went to the Central School, and progressed further to the Central Higher Grade School, so he was destined for white collar work like his father. Robert went into Boot dealership on the sales side rather than making boots the way his father had started, and worked for a number of years for the Mansfield & Sons Boot Dealers of Leeds, but he was ambitious and successful, and moved on to become proprietor of his own company The Jubilee Boot Company of Doncaster. Robert married a local Doncaster girl, Zillah Hannah Blackburn, a millwright’s daughter, in 1909, she would be the love of his life, and he of hers. The following year they had a daughter called Roma, and in 1912 a son called Stenton Haywood Jones (David Bowie’s father). Everything in the couple’s life was good, good prospects, two children, a boy and a girl, and close family on both sides. Then a shot rang out in Sarajevo that rocked the world, The Great War had begun. Up until 1916 there was no conscription in the British Army, but with the ever burdening loss of life brought about by modern weapons and poor leadership at the front, conscription was needed to stop the Allies being overwhelmed by the Germans. Initially in January 1916, only single men were conscripted, but within a few months conscription was rolled out to married men as well. Robert was therefore in a position where despite his settled life with a wife and two young children, he like thousands of others would either need to enlist and have some choice in the regiment they went to, or be conscripted and sent to any Regiment that was short of men. So Robert enlisted on 5th July 1916 into the 2nd Battalion of The King’s Own Yorkshire Light Infantry (KOYLI). The KOYLI put Robert through two months of basic training, let him kiss Zillah and his babies goodbye, and shipped him to France on 27 September 1916 with the British Expeditionary Force. less than two months after this, on 18th November 1916, Robert’s unit was thrown into the very last offensive of the Somme Campaign. 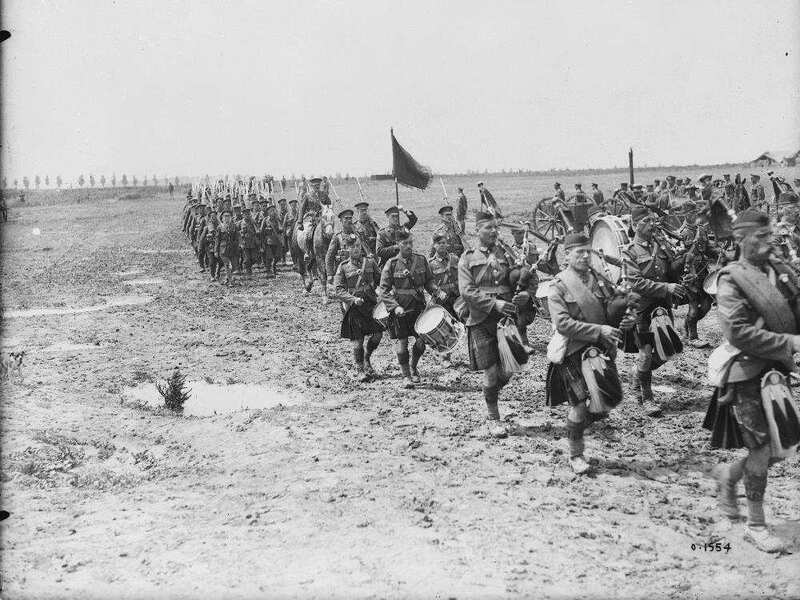 At 6.10 on that dark winter morning the 2nd Battalion of the King’s Own Yorkshire Light Infantry stormed up a ridge to try to capture the German trenches code named “Munich and Frankfort”, about a mile north east of Beaumont Hamel. Robert and his Yorkshire Pals attacked headfirst into a mire of shell holes and mud, through sleet and snow that turned to driving rain as the temperature of the day rose above freezing point. They hit a reinforced German strong point in the Munich Trench, and were cut down and forced to halt their advance and open a fire fight with the defending German units. So confused was the situation in some sectors that one party of British soldiers pushed past a German strongpoint without seeing it in the mist, only to find themselves attacked in the rear by the surprised German defenders, who surrounded them, and called for their surrender. Although cut off and outnumbered the Tommies refused to surrender and fought to the death, their bodies were found after the battle in a small concentrated heap where they fell in their last stand. About a hundred and twenty British troops, including two Privates and an officer from Robert’s Battalion of the KOYLI, did managed to reach and take part of the Frankfort trench, where, completely cut off and surrounded by counter attacking Germans, they held out on their own for an incredible eight days, fighting off determined German attacks, with scavenged weapons and ammunition and a couple of Lewis guns, resorting to hand to hand combat with bayonets and rifle butts towards the end. On the seventh day of the siege, the Germans approached with a white flag, and offerred to take their surrender, the offer was refused, so the Germans shelled the position, and followed this with a massed assault from all sides and overran their position. The survivors only contained fifteen men who weren’t seriously wounded, and most of these were too weak to stand. Robert was probably cut down by German machine gun fire during the initial attack up the ridge, where he was seen by his comrades wounded, but still alive . By nightfall on November 18th 1916, the survivors of the British attacking force largely fell back to their own original lines, leaving their dead and wounded behind. Robert was left with the other wounded and dieing on the muddy slopes of the ridge. Death came to these men in the mercifully quick form of bleeding to death if they were lucky, or in the more agonising form of thirst and cold over many days if they were unlucky. The wounded would have tried to crawl back to their own lines, but the ground was appaling, one officer was quoted as saying that this was the only engagement he had seen during the whole of the war where men were literally dieing from exhaustion of trying to haul themselves out of the mud. It was just under four months since Robert had been happy at home with his wife and children. Despite the incredible bravery shown by British soldiers of all ranks in the assault, through mud, mist, sleet. snow, driving rain, and a hail of machine gun bullets, the operation ended in a costly failure. The British had lost over 400,000 casualties in the Somme Campaign for the gain of a strip of land six miles deep and twenty wide. The news when it arrived back in Doncaster to Zillah with young four year old Haywood and six year old Roma was devastating. The love of her life was dead on a muddy slope, due to a futile attack, on a bitter cold morning. It was too much for Zillah, and she died three months just before Valentine’s Day in 1917, her heart broken. She was thirty years old. Because he was still listed as missing rather than dead, Robert’s effects weren’t finally disposed into administration until 1920, when he was declared officially dead by the War Office. The children’s guardian was Frederick Blackburn, Zillah’s Father, he had received a small pension of just over £2 per from the War Office for looking after the children, and in 1920 £225 7s as the sum of Robert’s worldly goods, the equivalent of about £23,000 in today’s average earnings. Once he reached 21 in 1933, Haywood received an inheritance of £3,000 from a trust fund that had been set up for him by his Father’s family. £3,000 in 1933 was the equivalent in average earnings of £500,000 in today’s value. The 1930s were a period of old endings and new beginnings for Haywood, his guardian Fred Blackburn had died in 1923, passing on a small inheritance and much responsibility to Rowland Blackburn his son who worked in the Boot making business. Joseph and Ann Jones their other Grand Parents on their father’s side of the family were gone, Joseph in 1918, and Ann in 1933. So Haywood Stenton Jones, having been given an inheritance decided that there was little to keep him where he was, and instead decided to follow his hearts desire; Show Business! The Smell of the greasepaint and the roar of the crowd. The money was burning a hole in Haywood’s pocket, and he fell in with an Irish Impresario, James Sullivan, with an attractive daughter Hilda Sullivan, who sang, danced and played the piano, a natural performer. One thing led to another, and Haywood got himself a Theatre Troup, that went bust, followed by a marriage to Hilda, and the purchase of a West End Nightclub in Charlotte St, named the “Boop-a-Doop” club to show off Hilda’s talents. This venture also failed, and the pair had to seek employment. This put a strain on the relationship, Haywood turned to drink and had an affair producing a daughter called Annette, who, remarkably, Hilda agreed to raise as their own. Finally the drink affected his health and Haywood was forced to consider the mess he was in. The result, apparently inspired by a dream, was for Haywood to get a job working for Dr Barnardo’s Charity, caring for orphaned children, Haywood would successfully remain in their service from the next 35 years. But during his time with Hilda World War Two happened, Haywood, like his father Robert, left his Family and went to war, in his case in the Royal Fusiliers, serving in North Africa and Italy. The difference this time was that Haywood would survive. On his return, he lived with Hilda, but met a girl named Margaret (Peggy) Burns, with whom he started an affair. Peggy had a colourful past, already having had two children through affairs, the eldest, her son by a French Jewish émigré, (David Bowie’s half brother Terry), was idolised by Bowie as he grew up. The couple carried on their unconventional relationship, by actually living with Haywood’s wife for a while, before Hilda had enough of the situation, told them to leave and granted Haywood a divorce. On the back of this Haywood and Peggy married in 1947, a few months after David Robert Jones (David Bowie) was born to the couple. Which brings us full circle. Knowing the intimate background of David Bowie’s family life through three generations, explains his fixation with in the Aladdin Sane Album of hedonistic young people being plunged into the hell of war, it had happened to his Grandfather and his Father, and he probably believed that the same would happen to him in the 1970s. Thankfully it didn’t, and we were blessed with a further 40 years of his brilliance. 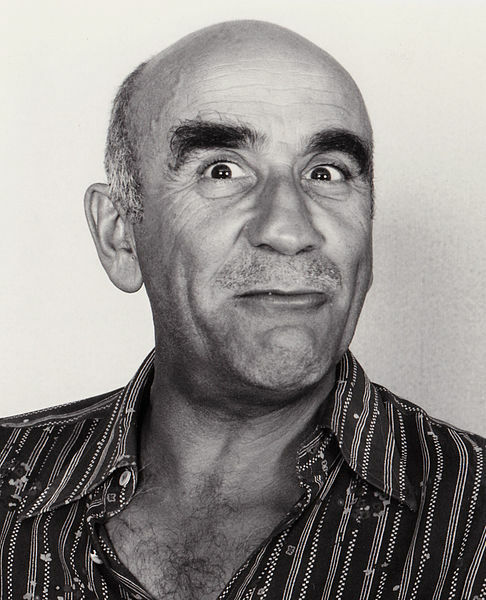 The great British actor Warren Mitchell passed in November, which was a great shame. He was well known to the British public of a certain age for his portrayal of “Alf Garnet” an outspoken East London working class character, who ridiculed bigotry by holding it up to the spotlight and showing it as laughable. One of the long running jokes in the series was that his put upon wife would knock him back into place when he started on an anti-semitic rant by pointing out that he was Jewish, and that his Grandfather was called Solly Diamond, much to Alf’s anger, frustration, and denial. This was a case of art immitating life, as Warren Mitchell was in fact Jewish himself, born as Warren Misell in 1926; of course the irony was deliberate. Time Detectives couldn’t let Warren’s passing go unmentioned, so, what was the mystery of Warren Mitchell’s (and perhaps indirectly Alf Garnet’s) Jewish Misell roots? The Misell’s were a long established Jewish family, with records going back to the early 1600s in England, indicating that they were part of the clandestine Jewish community that lived and traded in England, technically illegally, as the original Jewish community had been outlawed since the time of King John in the 1290s. However, more records for the Misells start to appear after 1660 indicating that they could act more freely in the community after Oliver Cromwell relaxed the the overtly anti-Jewish Laws in 1655 that had been in place before the English Civil War. Cromwell did this after an approach from Menasseh Ben Israel, a Rabbi from Amsterdam. Like everything Cromwell did, it wasn’t done for religious tolerance and brotherly love, rather he did it for purely pragmatic reasons; the Jewish population of Amsterdam was very rich, and well able to act as agents for loans, and, being a regicide Cromwell was in desperate need of finance to help rebuild the country after the Civil War. Although Cromwell couldn’t revoke the original laws banning Jews from England, due to massive opposition from various, mainly religious, opponents, he made it clear that the law would not be actively enforced, which then allowed the Jewish community that was already clandestinely in the country, practice their religion more openly, and they in turn were joined by many hundreds of Jewish Merchants and their families, predominantly from the Low Countries and Germany, as well as Spain and Portugal. We catch up with Warren Mitchell’s Misell line in the Georgian period of the early 1800s, during the Napoleonic Wars, when Amelia Ansell (Warren Mitchell’s Great Great Great Grandmother) married into the Misell Family via an Isaac Misell in 1809, and bore a number of children in Ipswich, David , Moses, and Benjamin, between 1809 and 1818. From the 1700s the Ansell family had been important in the Jewish community of Ipswich, having helped to get the first Synagogue and cemetery built in 1795/6. During this period many working class jews in London put their religion to one side publicly, although most would still have practiced privately, in order to fit in with employment and social norms, in fact some jobs were not open to Jews as it was not possible at that time to be a Freeman in a trade guild in London and the rest of the UK and also be a non-Christian, so to be publically Jewish and carry on a trade, you were on your own, having to operate outside of the recognised Guild system. This the Misells did, going into trades like Art dealing, that needed no Guild backing, just good connections, and a great understanding of net worth to buyer and seller. being Jewish also meant that there was potentially a ready market to pick up works of art at knock down prices from Jewish refugees fleeing from the Revolutionary terror in France, and then the Napoleonic wars raging across the continent, in Belgium, The Netherlands, Germany, and Spain. 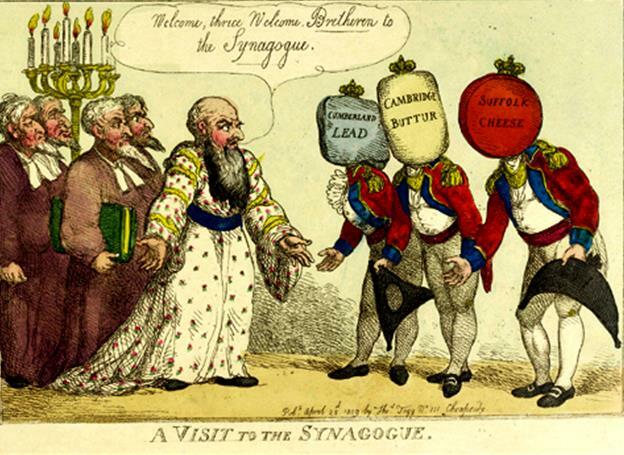 The Napoleonic Wars brought some respectability to Jews in Gentile London Society, especially as many Jewish volunteers flocked to the colours to help fight Napoleon, to the extent that the Royal Family visited Beavis Marks Synagogue to give thanks and to be entertained by the Chief Rabbi, who had given dispensation to the volunteers, in order to be able to fight in the army, to swear the Protestant oath of allegiance and on the Bible, but cleverly on the Book of Leviticus rather than the New Testament. Unfortunately some prejudice still existed, and the visit was lampooned by caricaturists. However, with the end of the Napoleonic Wars, and the rise of more industrialised Cities such as London, Manchester, and Liverpool, the axis of trade and wealth in England began to change, and much of the Jewish community followed it. Amelia herself had been born in London (Middlesex) and the Misell family had returned there in about 1819, and it was here that the next three children, Woolf, Joshua, and Julia were born. The elder brothers David, Moses, and Wolf made a move to the bright lights of Salford in Manchester, industrialisation had brought big opportunities to Manchester, and the brothers gravitated to wards it, hawking and selling initially on the streets, living in lodgings, and competing with the already well established old Jewish families of the area. These old families controlled the local Jewish community and trade, which made it hard for newcomers to break in to society, and most failed, but the Misell brothers were smarter than the average, and managed to get a foothold, rising from hawkers and street traders to merchants in their own right, Woolf and Moses dealing in art, and David opening a Tobacconists with his wife Caroline. This may have been because they had the advantage of dealing in more upmarket produce like Art which could be sold for higher gain to middle class buyers, rather than than the common cheap goods usually hawked in markets and on the street to working class customers. The other thing the brothers had as an advantage was that they stuck together, even when dealing in different areas of the market, they could always guarantee to back each other up and at the very least provide support and a roof over the heads of each other’s families, this in the mid 1800s was a big advantage. The brothers all married girls from Jewish Families, Jacobs, Solomons, and Isaacs. The Brothers’ families became established in Manchester; David and Benjamin set up as Tobacconists, Woolf and Moses as Art dealers, they all did well, most having live in servants, mainly from the Irish Community. In 1846 David went so far as to partner with a german Jewish immigrant, Julius Seelig, to get a copyright issued for their development of “London and Cumberland prepared black lead pencils” which they held in a warehouse and sold through a network of 17 agents, refusing to sell through smaller hawkers. But all things must end, and in 1863 David died and left the Tobacconist shop in the capable hands of his wife Caroline, whilst Moses returned to Islington in London, to eventually retire. In the meantime Woolf the youngest brother had moved to Liverpool setting up as a watchmaker, and his elder brother Benjamin came by whilst working as a travelling merchant, whilst keeping a foothold in Manchester with a Jeweller’s and Gentleman’s outfitters. Whilst the brothers travelled for their trade and to broker deals they stayed with each other, their children’s families, and their wives families. We now come to an interesting fact, Moses Misell’s eldest son Montague Misel married David Misell’s eldest daughter Rachael, his cousin, which means that the two brothers are both Warren Mitchell’s Great Great Grandfathers. Not that uncommon an arrangement, and common in communities that wish to keep both religion, and importantly, inheritance within the close family. It does pose some risk with genetic diseases, as two carriers of a recessive gene are more likely to pair up if closely related, and this is reflected in the number of such diseases that show up in both the Jewish and Pakistani Communities in Britain to this day, where first cousin marriages have been more common. Montague Misell, Warren Mitchell’s Great Grandfather, Made a living from the Art World dealing in Fine Art, he had been born and raised in Manchester, and had prospered in the middle class community, to the extent of joining the local Masonic Lodge in 1878, where he would have made many lucrative connections for a Dealer in Fine Art. These connections reached as far as New York USA where Montague had visited in his dealership in 1865, where he was described as a “Peddler 4th Class” and paid $2.50 in tax to the government for his activities over a 3 month period, before returning to the UK and marrying his cousin, so his son family prospered with him, he had ten children with his cousin Rachael, although Rachael would die prematurely in 1898. Montague would bring three of his sons, Hayman, Alfred, and Joseph, into the Art Dealing Business, and his eldest son David would join a Manchester Masonic Lodge like his father, but would be apprenticed into the Chemical Industry as a Merchant. Hayman (also called Hyman) would carry on life as a Fine Art Dealer, travelling around the Manchester area, staying in cheap boarding houses with Labourers and other Travelling Salesmen, and even spent a two week stretch in a Manchester Workhouse in 1910, possibly due to ill health whilst on the road. He married out of the faith to a local Manchester girl. Montague’s third son Alfred had ups and downs of his own, being arrested in Manchester in September 1910 “Having on 17th June, 1910, by means of false pretences, unlawfully obtained from Margaret Gillibrand, a certain picture, with intent to defraud.” He was found not Guilty and Discharged. No doubt the difference between a smart deal and a fraudulent one could be small, and sellers with less knowledge than buyers would often feel hard done buy in retrospect, a hazard of Dealing in Art. Alfred would go on to lie about his age (saying he was 6 years younger) and religion (claiming to be Church of England) and join the Rifle Brigade in London at the ripe old age of 40 in 1914 at the outbreak of War. What his wife and seven young children thought of this is anyone’s guess, but his age caught up with him, and he is discharged as “Medically Unfit” during basic training. Undeterred he re-enlists in 1915 initially with the Manchester Regiment, later transferred to the Lincolnshire Regiment, and is promptly sent to Calcutta in India as part of the Garrison there, mainly consisting of older and less able soldiers in reserve Battalions, who would have found life at the front too much to handle. Alfred spends three years in India, manages to get disciplined in 1916 for “washing plate & basin on upper veranda”, then goes on a bit of a binge in 1917 and is confined to barracks for 14 days for 1. Using obscene language to an NCO, and 2. being Drunk in his bungalow, a month later Alfred is found guilty of being drunk in barrack room and creating a disturbance, for which he gets another 14 days. Eventually Alfred comes home in 1919 with a dose of Malaria for which he receives a small army pension until 1921, suffering a 30% disability. Montague’s youngest son, Samuel, was a Dealer, and was and all together different kettle of fish, he had numerous run ins with the law, starting in 1921 when he was in his thirties, when he was convicted at Bow Street London of stealing two cases of rings getting 6 months inside for that one, in 1925 he stole a ring and got 4 months in court in Manchester, the same year he was convicted of Gaming (gambling) at Strangeways and bound over to keep the peace, then in 1926 3 cases of larceny (theft) for which he received 3 months, 1927 12 months from a Salford court for Housebreaking and larceny, 1928 one month at Wrexham for “Frequenting” which could mean a number of things legally, but may have meant he was loitering to with intent, i.e. casing a place to rob, 6 months in Buxton for stealing a medal and a ring in 1928, and 9 months for shopbreaking in Manchester in 1930. He sported a scar above his right eyebrow and across the right hand side of his neck, all in all, he was a piece of work. The rest of his upstanding middleclass family must have been appalled by him. Benjamin, one of the younger sons, seems to have fallen out with his Father and elder Brothers after his Mother’s death, he went from a fairly low level job as a Tailor’s cutter, to running away from home down to Gosport in Hampshire, about as far away from Manchester as you could get without leaving the country, where he enlisted in The King’s Royal Rifle Corps in January 1904, once he had reach the age of maturity. This didn’t last, and the following year he was “Discharges for Misconduct” a dishonourable discharge, which would have meant no reference, and no chance of finding anything but the most menial of jobs. Benjamin stayed in touch and held a strong friendship with his younger sister Rosie (Rosalind) but there was little else to keep him in England, and by the end of 1905 he had jumped a ship bound for Halifax Nova Scotia in Canada, with the aim of heading for Winnipeg Manitoba in the Canadian Mid-west, to work as a general labourer, a massive difference from his Fine Art Dealer Brothers and Father! Manitoba as a destination seems random, until we see that his Great Uncle Wolf had gone there with his family some years before. Whether Benjamin ever meets up with Wolf is unknown, and he next turns up volunteering for service in Canadian forces in WW1, after having spent a short time in Princess Patricia’s Militia. He is 5ft 4ins, black haired, dark brown eyes, and with a dark complexion, he claims to be Church of England, and is covered in tatoos a “Young America” tatoo across his chest, a girl with a Union Jack flag and a Ship, “Ben & Rosie” on his left arm, and Princes Patricia’s Regimental Crest on his right arm, and lastly two clasped hands above a heart on his right arm. He had also had an old injury of a burn scar in the centre of his back, 1915, he was working as a waiter. After joining up in Canada further records cease for Benjamin. In 1874 Woolf was operating in Montreal as a fine art importer and raised his family as a respected member of the local community. One of his sons went into the Tobacco trade as a travelling salesman, and joined the travelling Salesman’s Lodge of Masons, so the family in Canada carried on the recipe for success that had worked for them in the UK, Travelling Sales, Tobacco, and the Masons, with a background Business in Art Dealing for Patriarch of the Family. While Wolfe, his family and Benjamin were in Canada, David Misell, Montague Misell’s brother (Warren Mitchell’s Great Grand Uncle) had headed for the USA around 1870, lived in New York, Boston for a while, then back to Brooklyn New York. It is likely that he was able to do this off the back of the connections made by his brother Montague in his trip to New York 5 years previously. David worked variously as a Lawyer, Lithographer, and Electrician, but his claim to fame is that he invented the Falshlight as we know it nowadays. He started inventing in the 1880s with a new design for an Electric Battery, followed by an Electrically Illuminated Clock and an Electric Cigar lighter in 1894, and electric light in 1895, an electric signalling light in 1896, a bicycle lamp in 1898, a lamp for a gas lighter, and the first functional Flashlight in 1899, see diagram below. These were the first Flashlights used by the New York Police Department. His design was later improved upon after the sold the patent, and the the company he sold to went on to become Eveready, the huge multinational electrical company. David himself lead a good life in new York, he married a Jewish girl from the West Indies, Zillah Stine, a few years after arriving in 1876, and lived through to 1920 when he died and was buried in Manhattan. Returning to Warren Mitchell’s direct line, we come back to Montague Misell, Warren’s Great Grandfather, the Fine Art Dealer, he had gone bankrupt in 1908, mainly due to heavy gambling losses on flat racing at the horses, especially in Ascot week. He returned to London to live with his family and for a time sold off his paintings, and his wine seller to pay off creditors, before eventually returning to fine art dealing in later life. Montague’s eldest son, David (Warren Mitchell’s Grandfather) the Chemical Merchant and Freemason, unlike his flighty brothers who got tattooed and travelled to Canada, or wound up in the courts, David carried on working as a travelling salesman and Chemical Merchant moving from Manchester down to London around 1899, where he made a reasonable middleclass living without all the excitement and drama of his brothers. Unusually for the time, the family had an Indian Student named Jalal boarding with them. He had married Rebecca Cohen, from a Jewish family in London, they had 7 children, 4 boys and 3 girls. One of his sons, Solomon, would serve in the Royal Flying Corps in WW1, joining up as soon as he was old enough, which, fortunately for him, turned out to be 1918, so he served for six months as a Cadet Pilot, then a Pilot, and a Senior Pilot, before the war ended. When he died in 1957 David left his disposable cash a £228 to his son Montague, Warren Mitchell’s Father, a Glass importer. Montague lead a slightly more colourful life than his father. Montague’s first wife, and Warren Mitchell’s mother, was Annie Luberoff, the Hackney born daughter of Woolf and Nancy Luberoff, Woolf having been born in Merlekoff, Kreson, Russia in about 1857, Woolf was originally a Cabinet maker, then a Fishmonger, after passing on his trade to his sons. Woolf had brought his wife and children to England in the early 1890s, where the family prospered and grew. During ww2 Montague worked as a Supply Officer for the Ministry of Aircraft Production. Unfortunately Annie died in 1942 leaving Montague £591 in her will, and the following year Montague married Sigrid Corbet, Sigrid was a widow, originally called Sigrid Mann, the daughter of Saul Sigmund Mann and Bonna Mann. Sigrid’s father Saul Mann was originally from Cracow in Poland, at the time a subject of the Austrian Empire, and he and his family were naturalised as British Citizens in 1911, the naturalisation Certificate being granted by none other than Winston Leonard Spencer Churchill. They had come to the country in about 1905, and ran a boarding house down by the Docks in the West India Dock Road. Obviously they had some means when they arrived, and were wary of sounding too Jewish, claiming to be Swedish and Danish in the 1911 census, and boarding many Scandinavian and German sailors in their lodgings. Interestingly Montague’s daughter Betty (Warren Mitchell’s sister) married a member of the Mann family at the same time as her Father in Edmonton, so the families may have been close for a while. Warren was brought up in an Orthodox Jewish Family, but never had much time for religion when he was young, and was an Atheist when he got older. This is perhaps best illustrated when he bunked off from Synagogue to play football for his school team, and when they won 3:0 he asked “So where’s the thunderbolt?”. he abhorred all forms of religious fundamentalism whether Jewish, Christian, or Islamic, and had no time for religious ceremonies, especially not Christmas. However he was always culturally Jewish, despite changing his name early on in his career to sound more like a gentile. He study at Oxford University, but left early to join the Royal Airforce, like his Uncle Solomon had in the First World war, and then took up an acting career, encouraged by his friend from the RAF, the actor, Richard Burton. Although he played many serious roles in a long career, he will always be best remembered for Alf Garnet, where art imitated life. To celebrate the launch of the new Tom Hardy series Taboo on Saturday nights, we’ve taken a look at Tom’s real wandering relatives, and it makes for quite an adventure. Read On. During the time that Taboo is set, a distant cousin of Tom Hardy who won free passage to Australia via a trial for theft in the 1800s. William Sidney Egmore born in 1802, was a Postilion (an outrider on a large train of horses pulling a wagon or stage coach) and an Ostler (working in a Coaching Inn or Tavern). In 1835 William was charged with stealing a Gelding worth £5 an apt crime for someone who looked after horses for a living. William Egmore was convicted, and sentenced to transportation for life for a first offence. He was sent to Kings Lynn Gaol for holding, then on to the Prison Hulk Ganymede moored just off the coast, finally he was boarded on to the good ship Moffatt which set sail for New South Wales in Australia. From the prison records we know that William Egmore was 5ft 6ins tall, with brown hair turning grey, bald on top of his head, and brown eyes. His complexion is described as dark, ruddy, and freckled. He had had a hard time of it in gaol and on the prison hulk, this is reflected in his records as having a tooth knocked out, and a scar across his left knee, bizarrely his gaolers also noted that he had a particularly hairy chest! William obviously behaved himself in Australia as by 1844 Whe had earned a ticket of leave (conditional freedom) only to die five years later. However this Egmore was a distant cousin, not a direct ancestor of Tom Hardy. They were another story. Tom Hardy, genetically according to his paternal line should actually be named Tom Egmore, as he is a direct male descendant of the Egmores in an unbroken Y chromosome line, which immediately gave us a mystery; why the Hardy surname? The story starts in Norwich, Norfolk in the mid 1700s, where there was the Eggmore family, eventually to become the “Egmore” family as their name was re-written over the years. Egmore is an extremely rare and distinctive Norfolk name, it comes from the Hamlet of Egmore, now called “Egmere”, lying in between Fakenham and the coast, a tiny quiet place, not that far from the aptly and wonderfully named “Little Snoring”. Egmore had forty seven people living in it in 1832. From the 1760s into the early 1800s Tom Hardy’s Egmore ancestors were Bricklayers and builders of some standing. Nicholas Egmore started his apprenticeship in 1769, once qualified he trained up his son Richard in the trade. Richard would surpass his father in his skill. Some of Richard’s finest work, was carried out in 1817 at Snettisham Old Hall, where his fine work went into the entrance porch, hall, north staircase with cast iron balusters, tented plaster ceiling and cornice. This work is associated in payment accounts as work by “Richard Egmore, builder”. Despite his skill, Richard was declared Bankrupt in 1825 whilst carrying on businesses as a Builder and Inn Keeper at Snettisham, and he eventually turned his back on building to try his had at the trade of a Coal Merchant, where he was relatively successful for some time (and there are still Egmores selling Coal in Norwich to this day). Richard had two daughters and a son born between 1807 and 1821. The son was baptised Randal Egmore. Richard was ambitious and moved into speculating as a middle man, a Commission Agent for the Sale of Coals, but overreached himself, let down by his customers, in 1843 he was forced to apply for Bankruptcy, and ordered to travel to London to answer to the Commissioner Joshua Evans. This put Richard in a bad place, and the strain showed, by 1847 his wife Raechel had died, and he followed her a year later. While Richard’s business as a Coal Merchant had been doing well, he had earned enough to let his son Randal get into a more genteel trade of a Hatter, which in some ways was good, given Richard’s eventual bankruptcy in the Coal business, but had a hidden downside not known at the time. The phrase “Mad as a Hatter” was not coined without good reason, and the Mad Hatter in Alice in Wonderland represented the worst case of industrial malady. Hatters spent a lot of time in enclosed workshops, treating beaver skin hats with mercury to give them a beautiful sheen. Unfortunately the fumes from mercury are poisonous, but they take their time to poison. A Hatter would breathe in the Mercury fumes for many years slowly being poisoned by them, this would lead to bouts of madness and an early death. 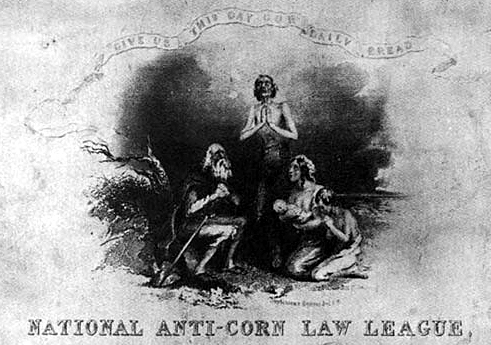 Randal was a Methodist of the more politically active dissenting variety, and lobbied for the repeal of the Corn L aws in 1845. At that time there had been a failure of the potato crop (the same as in Ireland) and corn prices were being held artificially high to keep out cheap foreign imports of grain. This combination of crop failure and high prices for bread meant that whilst the poor were starving, the corn merchants were becoming rich. Randal’s religious and political conscience, would not let him rest in the face of such injustice, and his witnessing of the rapid demise of his father and mother once they fell on hard times, lead him to take the major step of giving up his Hatting trade, and devote himself to Missionary work amongst the poor in Norwich. Randal became the Superintendent of the Norwich City Mission for over a decade from the 1850s to the 1860s, a responsible and charitable job for a solid middle class man of principle. The Mission did Missionary work within Norwich preaching the Gospel and bringing comfort to the sick and poor. For all his good works The Lord showed little mercy, Randal’s years as a Hatter eventually caught up with him and he died in 1862 aged only 48. If Randal was the epitome of a genteel middle class Victorian Christian social conscience, his sons were something else. Having lost their father whenthe eldest son Edward Joseph was 13, and Arthur his younger brother was 4, they lost their Methodist Lay Preacher Father who spent most of his time organising the care of the poor and needy, perhaps to the neglect of his own children, and his loss robbed the boys of a responsible male role model. The boys lost no time in going off the respectable rails as they grew up in the 1860s. Edward Joseph being the eldest boy, had a lot of responsibility put onto him to help keep the household finances above water, his Mother did her bit working as a School Teacher to bring some money in. It appears that Edward Egmore was literate and wanted to make money for his family, and being personable, he became a commercial traveller selling stationary and other provisions. Trying to do the right thing by his family opened up the door to a world of temptation he hadn’t known before as the son of a Methodist preacher. He was now independent, self reliant, and persuasive, travelling to places where he wasn’t known, and where there was no one to judge him, a heady mix for a young man with some money in his pocket. Edward thrived in the role, spending his twenties and early thirties travelling and selling unmarried and staying in a boarding houses in London, he had a fairly carefree life, his wife and sisters back in Norfolk, and his younger brother by now off in the Army. Then came the summer of 1882 and a trip back to his family in Norwich when Edward hooked up with a young housemaid, Elizabeth Hardy, and sure enough this liaison lead to Elizabeth becoming pregnant. This was not what Edward wanted in his life, and initially Elizabeth has the baby without Edward’s support, leaving the father’s name blank on the birth certificate. Elizabeth is however smart and spirited, so she follows a convention adopted by many single mothers in the nineteenth century, when the Father’s name is known but he won’t take responsibility for the child, she gave the baby his father’s first name and surname as first name and middle name on the birth certificate, the boy born on 21st March 1883 and named “Edward Egmore Hardy” by Elizabeth. Whatever pressure Elizabeth could bring to bear, it obviously worked as later in 1883 Elizabeth Hardy and Edward Joseph Egmore are married in Norwich. The marriage was a difficult one, although it is obviously consummated as a daughter is born in the following year. But Edward had a wanderlust born of many years of independence on the road selling, and a wife and children would be a burden to his independent spirit, so much so that in January 1884 Edward took off for Australia. He landed in Victoria working again as a Traveling Salesman. It’s possible that Edward intended to send for Elizabeth, but circumstances would suggest otherwise, as, spirited woman that she was, in September of 1884, she followed him out under her own steam with their daughter as a babe in arms . This was a massive undertaking for a lone woman with a baby who had never left Norwich before. It also smacks of desperation, especially as she left her infant son Edward Egmore behind. Young Edward Egmore Hardy was left with Elizabeth’s Brother Michael and his wife Annie. Elizabeth couldn’t leave her youngest child as a baby, and to take both children would have cost much more and been hard for her to cope with, so the decision was taken to leave little Edward behind. Elizabeth was determined to find her wayward husband, and on 17th September 1886, she manages to persuade the Victoria Police to put out a warrant for his arrest on the charge of desertion of his wife. This works as Edward eventually returns to Elizabeth, and the warrant is dropped. The warrant is interesting as it describes Edward as “having a slight build, fair complexion, brownish hair, a broken nose, with a moustache, and wearing a black coat, light trousers, and a boxer hat”. The couple live for a while Geelong, Victoria, where they had five more children between 1889 and 1894, including twins, a total of three girls and two boys, although sadly one of the twins died as a baby. After the birth of their last child, Edward again takes to his heels, and this time leaves the state fleeing to New South Wales, around the Darlinghurst area. Edward’s life goes downhill from there. Without the steadying factor of his wife and children, he is arrested five times between 1894 and 1901, variously for being drunk, hawking without a license, and using obscene and insulting language, most likely to the arresting officer. For a little bloke of 5ft 6ins (his wife thought he was a little taller at 5ft 8ins) with a slight build who had already had his nose broken, he had an awful mouth on him, and seemed always up for trouble. He spent various spells of between a few days and a month in Jail, but is rollicking days were numbered. By 1900 he had a scar on his chin and was nearly blind in one eye from his drunken the drunken fighting. He lasted a little longer, but in 1907 he died in Liverpool NSW Australia, aged just 58. Elizabeth and the children stayed in Australia, Elizabeth would live into her seventies and died in 1928. The young Edward Egmore Hardy, left in England, never saw his parents again after his mother took off to find his father in Australia. Edward’s brother had a slightly less raucious, but equally unpleasant story. Arthur joined the army in 1878 and served through to 1881, when he was discharged due to showing symptoms of syphilis, notably giving him a perforated palate. According to the Army he’d contracted syphilis about 18 months before joining the army, so when he was about 18, so like his older brother, had already sampled the female delights of Norwich at a young age. The boys’ Methodist Father would have been turning in his grave. Syphilis ended Arthur’s promising career in the army. A shame as Arthur had already been promoted to Sergeant after a couple of years, and been posted to Cork in Ireland. But the Syphilis was a ticket out, so he was “invalided out”, and sent back to Civvie Street. Within two years of leaving the army he was married. 1883 turned out to be the same year that both brothers woulkd get hitched. His wife was a local Norfolk girl, Julia Reavell. The couple started a family straightaway. Nothing daunted, in 1884 Arthur followed the example of his brother Edward and moved abroad. In Arthur’s case he took his wife and children with him and moved to the USA, initially to New Jersey, and then to Philadelphia. Interestingly he gave a false name to the shipping company as “Andrew” rather than “Arthur” Egmore, perhaps a clerical error by the purser, or perhaps an attempt to disguise his identity, perhaps Arthur was running from some circumstances in England? In any case Arthur worked as a salesman in Groceries (Dry Goods) when he first went to the USA, no doubt his English accent and military bearing set him apart. He then found work as a Clerk for many years, and a manager in 1901, but there is an anomaly in as much as he listed himself as a solicitor in 1896, perhaps he was working as a Solicitor’s Clerk, or perhaps his Syphilis was affecting his brain, as was often the case in pre-antibiotic times, he may have been slightly delusional. This possible mental tension is backed up by the fact that his wife took the children and steamed back to England in 1893 and 1899, and stayed in England for some months each time. In 1910 Julia was admitted to a sanatorium, most likely as a result of Tuberculosis, but possibly she may have also Coming backcontracted syphilis from Arthur. Arthur lived alone during this time, and claimed to be a widower. Arthur’s health worsened, and in August 1910 he died of Pneumonia. Julia his wife returned once more to England in 1913, but went back to America and worked as a Housekeeper. A few years later her Tuberculosis flared up again and after three weeks in hospital she died. Their children had made their own lives in the USA and stayed there. 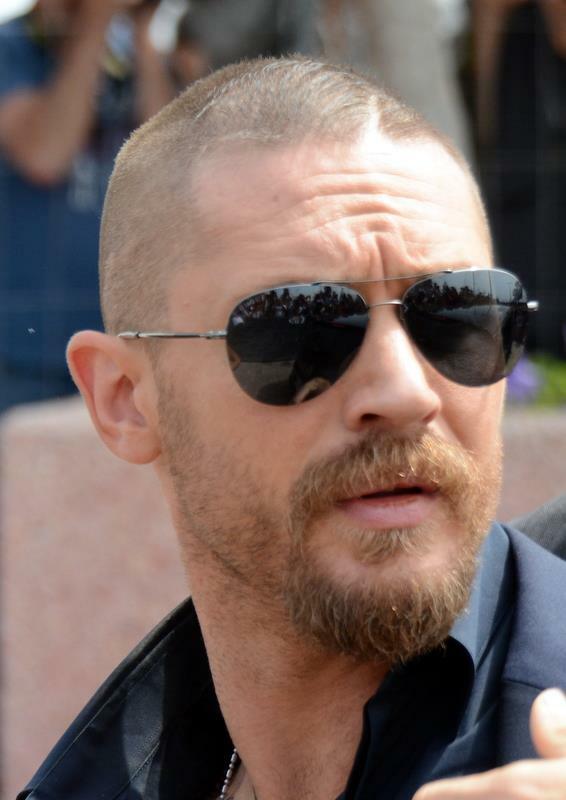 We now come back to Edward Egmore Hardy, Tom Hardy’s Great Grandfather. While his father and mother, brothers and sisters were off on the other side of the world in Australia, young Edward Egmore Hardy, was left with his Aunt and Uncle rural Norfolk. Perhaps this was meant to be temporary until Edward could be brought out to join his parents, but given his father’s way of life, that would have been wishful thinking. So his Uncle and Aunt, Michael and Annie Hardy were left with their own two children as well as young Edward, a struggle, made worse when Michael Edward’s Uncle died in 1890, when Edward was just ten years old. His own parents having abandoned him, Edward now lost the man who had brought him up as a father. Edward did what he could to help with the dire state of the household budget, but work was hard to come by and at the age of fifteen he was working as an errand boy. An errand boy’s was hardly helped to cover his own keep, so on 31st August 1898, the 5ft 1ins fifteen year old boy with brown hair and blue eyes, volunteered for the Navy. Three years later in 1891 he is onboard HMS Resolution anchored in the harbour at Gibraltar. On the 31st March 1905 after seven years before the mast, Edward Egmore Hardy left the Navy, and went back into civvy street. 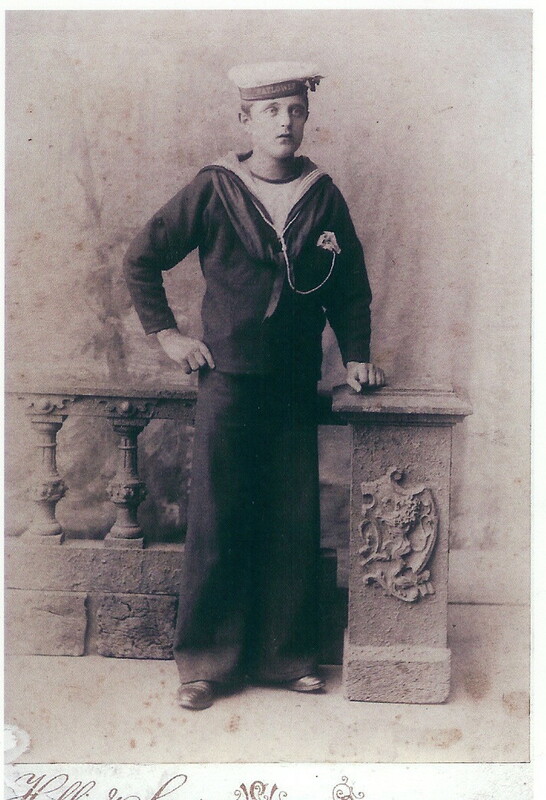 Edward had literally grown in stature by seven inches to 5ft 8ins during his time in the Royal Navy, reflecting on how poor his Aunt had been and how undernourished Edward had been. Edward had also grown in professional stature given his extensive training, good character, and steady service, so it wasn’t hard for him to land a job within a month in the London Fire Service based out of Norwood in South East London as Royal Navy Tribe and the London Fire Service Tribe were closely tied, and the London Fire Brigade had originally been manned almost exclusively with ex-Royal Navy Sailors. It was considered that ex-sailors were very able in the role due to their familiarity with climbing to heights, working with ropes, and taking orders. A second major factor was that fires were common in the many of the warehouses and docks in London along the Thames shoreline, due to the storage of highly dangerous and inflammable merchandise there, but due to the narrowness and crowded nature of the dockside streets, the only way to attack the flames was often from boats on the River Thames. Edward spent his first month in Drill Training, then transferred between various Fire Stations in Central and South London, Holborn, Poplar, Battersea, Tooting, and West Norwood. It was while living in South London in 1907 that Edward met and married an Irish girl from Tipperary, Catherine Theresa Sargent. Two years later they had a son, Patrick. Tragically Patrick died at the age of two, to be followed a year later by his mother Catherine. Edward had lost his son and become a widower at the young age of 29. He threw himself into his work in the Central London Fire Stations, and finally ended up at the London Fire Brigade Head Quarters to study the Steam Class of Engines that were supplanting horse drawn engines. These machines replaced muscle power of animals and men to propel themselves, pump their own water, and even turn a dynamo to generate electricity for night time work with spotlights. But the year was 1914, and the War that Edward had trained for in the Royal Navy, had finally happened. All the time Edward is in the fire service he was also a member of the Royal Fleet Reserve (RFR) so liable to call up in the event of war. It is this call to arms in 1914 that must have given his life a new sense of purpose after his recent tragic family loss. It is no surprise therefore to see that he couldn’t wait to get back into the Navy to do his bit. But before he does, he married his new sweetheart Maud Edith Samme at Portsmouth. 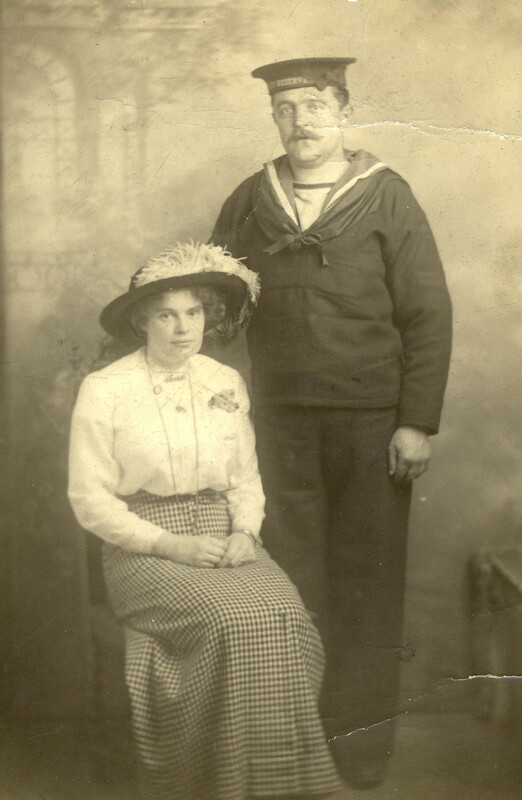 By August 1914 Edward had left Maud in Port and was serving on HMS Europa the flagship of the Atlantic Fleet, he spent seven months onboard her, but fortuitously was transferred off when she steamed out to the Dardanelles. His experience was considered more valuable in a thinking role, and so instead of the heat of Turkey, Edward took his electro-mechanical knowhow to Portsmouth, spending time in research on Torpedoes and other weapon systems, serving there through till he was demobilised in 1917. Given the poor start he’d had as a boy, his Naval career was a great reward, giving him comradeship, skills, and, it must be said, a chance to do his bit in the war without too much risk, and good luck to him! Edward was qualified in the specialist area of Steam Class appliances in the Fire Brigade, and his service for King and Country was appreciated when he returned from active duty in 1917, as he was welcomed straight back into the Fire Service working in the Docks of Wapping, Shadwell, and Rotherhithe. He retired from the London Fire Brigade after nearly twenty eight years of service in 1932. His retirement was briefly interrupted at the start of WW2 when he went back onto the London Fire Brigade listings for a month in 1939. Edward would live a further ten years until 1949. Edward and Maud had three children between 1916 and 1926, the middle child was a boy names Edward Thomas Hardy, born in 1918, he was Tom Hardy’s Grandfather. Unlike his father, Grandfather, and others in his direct line of descent Edward Thomas Hardy lived a less adventurous life. He worked as a Clerk in the Port of London Authority, the overseers of the Docks in London, living in Ealing West London from the 1940s through the 50s and 60s, before retiring to Devon. So quite a story through the generations, and it explains why Tom is a Hardy rather than an Egmore, it leads to the intriguing conclusion, that if your surname is Egmore, you are most likely to be related to Tom Hardy, especially if your ancestors are from Norfolk, Australia, or the USA. Perhaps his character in Mad Max, and his own history of hell raising is an echo of a meme that was passed along with the Egmore genes? If you’ve enjoyed reading this article, and would like your own Family tree researched and written up, feel free to drop me a line on paulmcneil@timedetectives.co.uk or tweet me on @timedetectives. Single surname family trees cost £300 and take 4-8 weeks to complete with factual report and certificates.